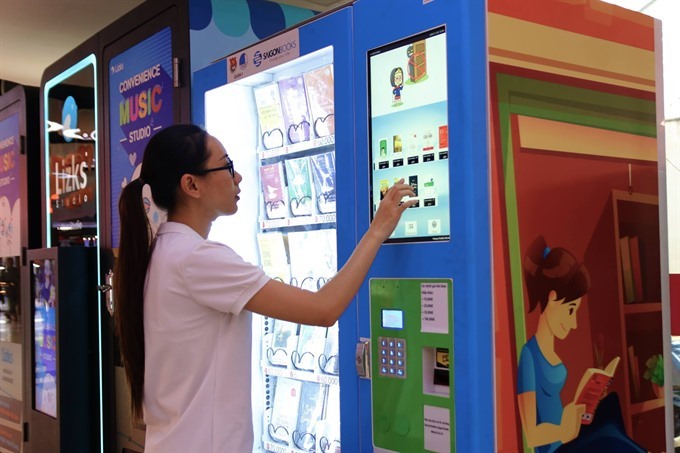 HCM CITY — A book vending machine has been set up at Sense Market in HCM City’s District 1. Installed by the Saigon Books Cultural Joint Stock Company and the district’s Hồ Chí Minh Communist Youth unit, it will sell 25 bestselling books distributed by the former. They include novels and reference and self-development books such as the Vietnamese translation of Powerful People Skills by Heather Hansen and Để Anh Nâng Em Dậy, Để Anh Lay Em Tỉnh (Let Me Raise You Up, Let Me Wake You Up) by Du Phong. They are priced at VNĐ60,000 (US$2.6) and VNĐ70,000 ($3), a 5-7 per cent discount on their price at book stores.